Partners With Paws: Service Dogs and the Lives They Change is a compilation of over 50 stories that highlight the important role service dogs play in people's lives. From both puppy raiser and service dog team perspectives, readers gain an intimate understanding of service dog training, service dog team matching, and the liberating impact service dogs have on people with both visible and non-visible disabilities. 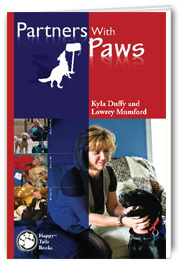 The heartwarming, educational stories in Partners With Paws provide an insightful introduction to the breadth of life-changing skills for which service dogs can be trained, inspiring volunteers and nudging people who could benefit from a service dog's skills and companionship to take the next steps in the application process. Books are expected to start shipping next week! This book is available for pre-sale! Purchase copies today and select to have us make a double donation to the organization of your choice (must be in our partner program) or get $2.00 off per book. Sale ends March 15th. Sounds like a great book --- thanks for letting us all know about it.